The is my most recent completed project and one that I am somewhat happy about. I mean I’m not going to complain about it’s usefulness or anything but the finish just did not come out as well as I had hoped. Though I’m not complaining, the idea was unique as was the situation that made it possible, but nevertheless, there are still improvements that can be made. The process started when I wanted to fill in an unused/unnatural space in the wall of my workshop. 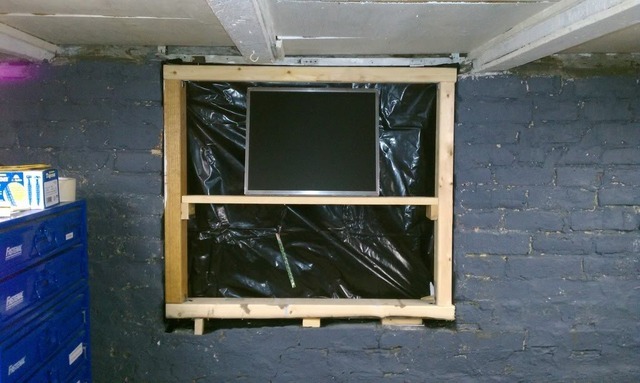 The previous home owners had removed an old basement window, but only bricked in one layer instead of two that the foundation was thick. This left a 4″ deep opening in the wall and one day, the thought of a kiosk just popped into my head. How nice would it be to have a computer at my point of use right next to my work bench? A quick check of the forums, the web site or having my iTunes at the ready when I needed some music? A lot of factors were also playing to my favor with this as well. 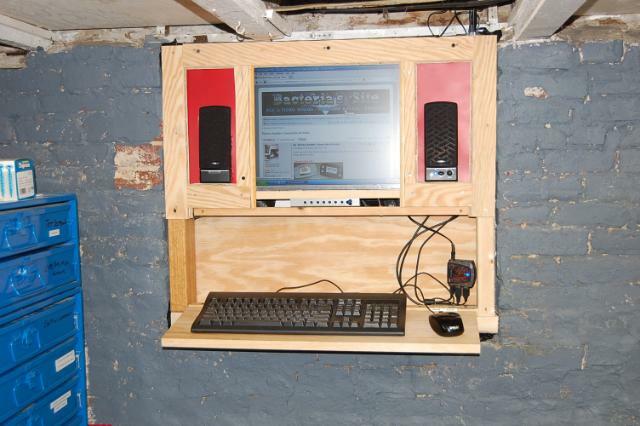 As you may notice, the CPU is actually not built into the wall, just the monitor, speakers, and USB HUB for peripherals. The previous owners had removed an old radiator but left two large holes in the floor, one right directly above the the hole in the wall! As it turned out as well, my wife had here old HP desktop, (still running XP) that had been sitting idle in my office for over a year that I could use. So, basically all I had to do was run the lines down that hole and tuck the wires into little cutout notches in the framing and then trim over them and boom! 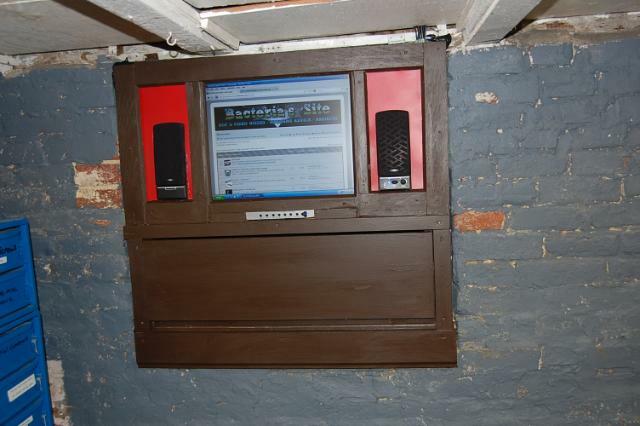 A computer in a wall! And the best part, everything in networked in via a Linksys HubDrive mini server and tied in with my wireless router. But if I find myself needing a bit more computing power for whatever reason, I can simply hook my laptop up to this and be ready to go with that! I do have to say though, I am happy with how most of this came out, but the finish just did not work which I will be in the process or redoing before too long. I used 1/4″ CDX plywood for the trim on the top and really, plywood just does not have the same quality as pine, nor does it work well with cutting and ripping for finish applications. But as the pic to the right shows, the concept is in place and there could be some major improvements with the speakers and who knows, maybe some blue LED’s will make their way into the mix. For now though, it’s fine and will be staying as is until I can get around to it again.